Do you struggle with making your inbox an asset for your business, instead a liability? Have you given up on ever seeing “inbox zero”? Is your inbox just an in/out tray without serving a bigger purpose? You’re not alone. I know many writers, bloggers and freelancers who have thousands of unread emails in their inboxes. And it’s not just unread emails that are the problem. It’s tracking client follow-ups if you didn’t get a response or having too many subscriptions that you have to sift through daily. However, there are so many ways you can power-up your inbox. 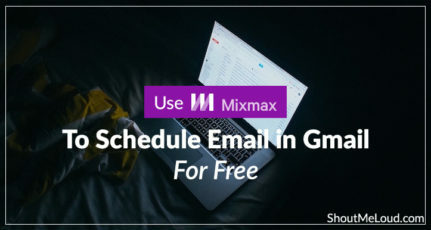 And since most of us use Gmail, I’m going to list down a few awesome Gmail extensions that I have started using to turn my inbox into a productivity powerhouse. This is by far my favorite, and also most recent, addition to my Gmail inbox. 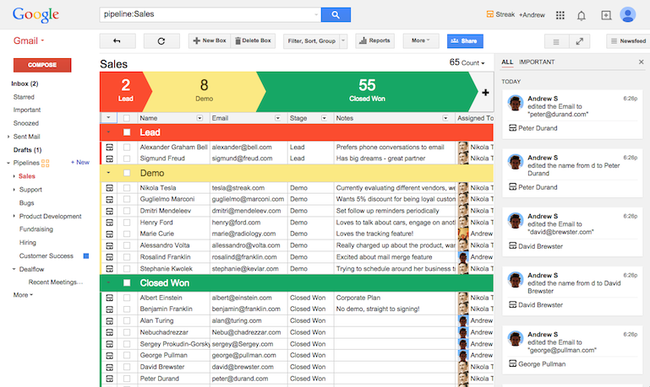 Streak is a CRM – customer relationship management – tool. It has too many features to effectively outline, but here are the main things I love about it. Add emails to boxes (each client or project can be a box) so you can see all communication with one client in a go. Set emails to return to inbox if you don’t get a reply. I’ve even gotten a few jobs just because I followed up when I didn’t hear back. Track the stage a project is in (closed, won, negotiations) and the value of the entire project. Assign tasks and reminders to each box. There are a lot more features, and while I use the free version (and it’s more than enough for my needs) you can also sign up for a paid account (starting at $19/month) to upgrade your experience. 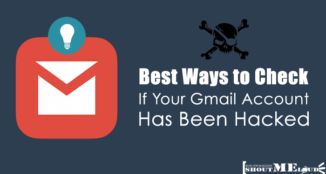 If you’re installing one external Gmail extension, let this be it! Boomerang has been around a while, and when it launched it was a one of a kind tool. A boomerang is a Frisbee like toy, which when thrown in the air, returns to you itself. Now that’s cool! So the idea of Boomerang, the app, is similar. You can set emails to return to your inbox in a few days. This is perfect for when you have to do a task, let’s say call someone or view travel plans. You setup the email to return to your inbox on that day, which allows you to remove the email from your inbox for the time being. Since then, they’ve added more features. You can write an email and schedule when you want to send it. This is perfect for making sure your email hits the receiver’s inbox when they’re in office. You can also return email to your inbox if you don’t get a response. I’m still on the free version, which has a limit of 10 emails a month (because I use Streak, which has similar functionality), but the paid accounts start as low as $5/month. As a freelancer, I often have to email people I’ve never met, and sometimes the only thing I know about them is their email address. When applying for freelance gigs, it’s a little nerve-wracking, as I don’t like using the same template for every job I apply to, but I can’t exactly guess someone’s name or job-based on their email address. 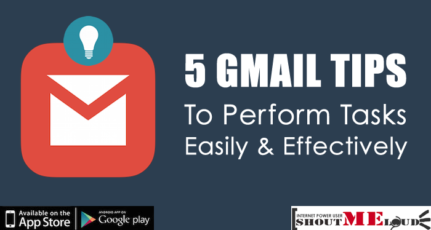 Before Rapportive, I’d quickly Google the email to see if something popped up, but Googling a potential client always took up too much time or didn’t result in any useful results. 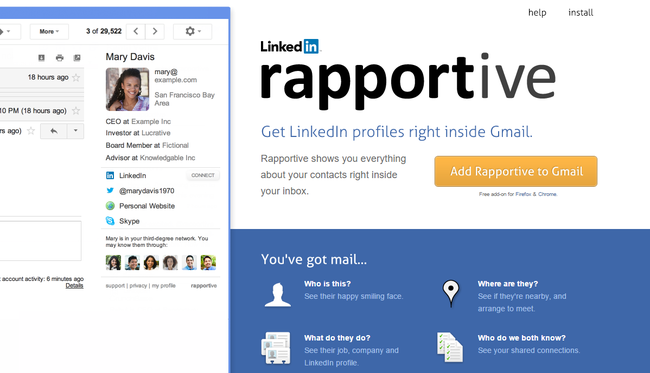 Rapportive provides you with your contact’s LinkedIn information right in your inbox so that you can customize emails. It’s a lifesaver, as I now know which industry the client is in, what experience they have, and even what they look like. You can even find shared connections without leaving your inbox! Everyone has a favorite to-do list app. I’ve gone through a few myself in the last year or so, and while some of them have come close to being “perfect”, none has gotten as close as Todoist. Now Todoist is technically also a web-app, which you can access without Gmail, but the Gmail extension let’s you maximize its utility. From within your inbox, you can turn emails into tasks with just one click, add them to an ongoing project, set deadlines or even assign them to someone else to handle. Of course, since Todoist is available on a total of 13 platforms – which includes every device possible – you’re never far away from your to-do list. While I’m still using the free version, an annual subscription is just $29/year. I could go on about more Gmail extensions that are awesome and helped me get my inbox under control, but too many extensions can end up being distracting. These five extensions, however, are my go-to, and used in each of my Gmail inboxes. If you haven’t tried it yet, I’d also suggest taking a look into Google Inbox. Since it’s not an extension, I’m not including it in this list. However, I’ve seen people who have thousands (yes, thousands) of unread emails in their inbox get down to inbox zero because it bundles emails based on type, allowing you to filter out noise very quickly. If you’re in desperate need to control your inbox, I’d suggest starting with Inbox to help with email triage. Which extension would you recommend I try out next? I’d love to hear back your thoughts in the comments as I’m sure there are many I either haven’t heard of or haven’t given a fair shot to! Thanks @Nida for writing this nice post. From so many years I’ve been looking for such features in gmail but didn’t know right addons and role of each one of them. You cleared everything in this post, I am going to try each addon after posting this comment. Cheers ShoutMeLoud! OMG! There is only one thing to say about this! Gmail has grown. It is a mature kid with these kind of apps. I didn’t know most of them existed. I get subscribe to as many emails as you do, and they can at times build up really fast, cluttering your inbox, and slowing down your work morale. Thanks for sharing these. Glad I could help Patrick! Did you try out Unroll.me? Hi Nida, Just a wow for this post. these all are very helpful chrome extensions for freelancers. I going to check out these soon. Thanks! Awesome! Let me know how you liked them! Thank you Nida Rasheed for this very informative post. I didn’t have any idea about gmail extension. I’ll love to use those extension. A nice collection of Chrome extensions, I would like to suggest Evernote extension which is one of my favorite chrome extension to bookmark the pages and take screenshots on the fly. Absolutely! I love Evernote, and use it every day. However, it’s not limited to just Gmail (you can clip any web page) so I didn’t include it in this list. But yes, it’s definitely my favorite way to clip pages and links. I use Streak and Todoist religously and think they’re great. I was using Rapportive, but it kept being a bit flakey for me (may have improved since), but I’m using FullContact in it’s place. Very similar, but seems to perform better for me. I don’t fully understand why the whole world isn’t using gmail to be honest…. Haha Gareth! I agree. I still get shocked when someone tells me they use Yahoo or Hotmail! But why!! Gmail is just a more powerful email service. And yeah, I’ve used Rapportive and FullContact, but honestly I had issues with FullContact being buggy, so I stopped using it. May give it another shot when I do a clean install on my windows again. Great post you have here Nida, will check them out especially the one that’s gonna help me unsubscribe from some of the list I couldn’t remember subscribing to. Hey! Often it’s just a matter of breaking the large job down into smaller parts, and then you’ll realize you don’t need to ask anyone to help you. For example, with Adsense, I’m sure there are posts here on ShoutMeLoud that explain the process. Just write down each step and it will seem easier to get through 🙂 Good luck! Glad I could help Rahul! Rapportive seems like a really useful tool, thank you for sharing. Also I’d like to suggest a good alternative to Boomerang for freelancers, it’s called Deskun. 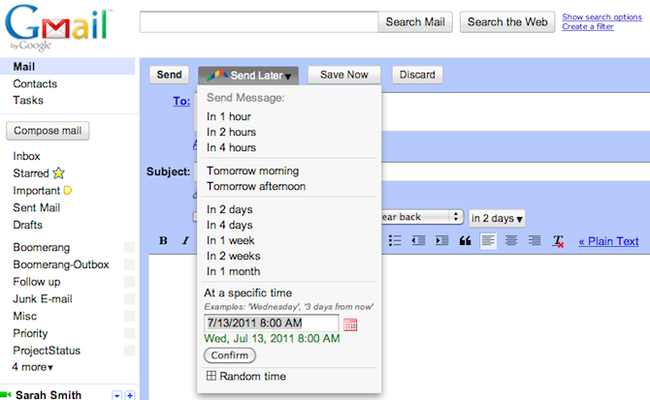 This extension allows to track sent emails, send later, set up reminders and use templates completely for free. There are paid options like organizing a help desk system for your customers, or a task management system. But free Gmail features would be useful for anyone. I hope this helps someone to be more productive.